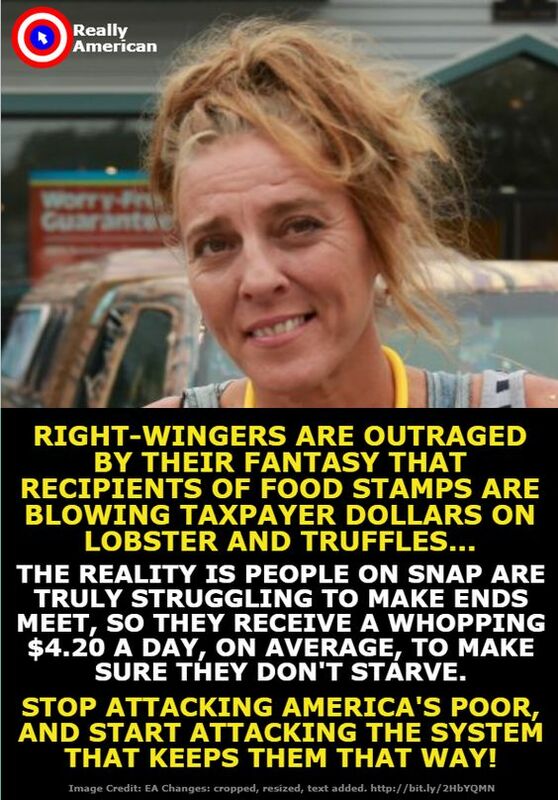 This entry was posted in Facts & Statistics, Hunger & Poverty, News & Views and tagged $4.20 a day, flawed system, food stamps, hunger, lobster, outrage, poverty, reality, really American, right-wingers, SNAP, starvation, struggle, truffles on May 22, 2018 by Ray Buchanan. Here we go again. Will we even learn from history? 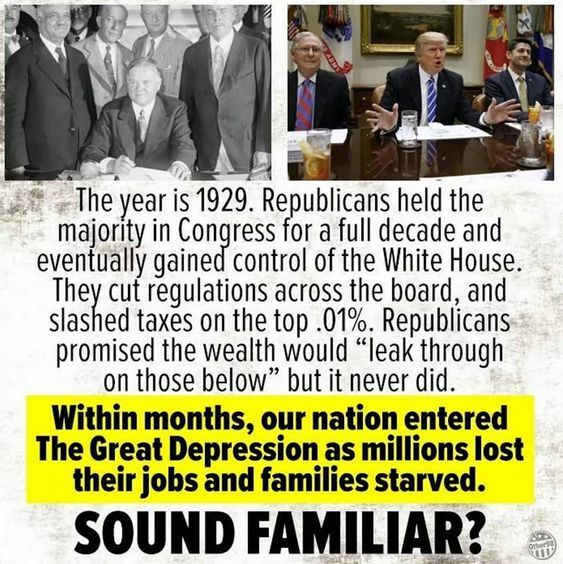 We now have a country where the wealthy are in control. They have and use the power to feather their own nests at the cost of the poor and middle classes. The recent tax scam is only the latest demonstration. We now live in a nation where 95% of us provide labor and benefits for the power elite. Welcome to a class society where your position is to serve the wealthy, Unless we decide to change it, this is fast becoming our world. This entry was posted in Facts & Statistics, Hunger & Poverty, News & Views and tagged 1929, Congress, control, families, Great Dpresssion, jobs, nation, poor, poverty, regulations, Republicans, scam, starvation, tax scam, taxes, top .01%, trickle down, wealth, White House, world power elite on December 28, 2017 by Ray Buchanan. who are the real criminals? 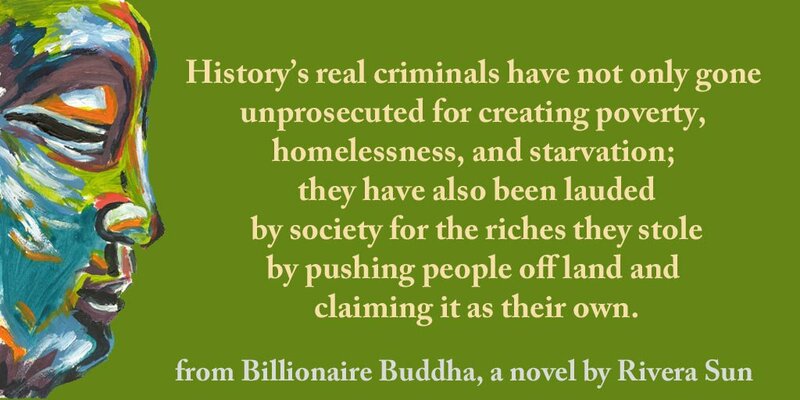 This entry was posted in Hunger & Poverty, Quotes and tagged Billionaire Buddha, criminals, history, homelessness, honor, hunger, poverty, prosecution, riches, Rivera Sun, starvation, wealth on November 9, 2016 by Ray Buchanan. Terrorism, like everything else, a matter of perspective. For the majority of our human family who always lives in the shadow of poverty, who are stalked daily by hunger, and who can never escape the claws of disease, terrorism is being forced to watch your children suffer needlessly while you realize you can do nothing to help. The true terrorists are those of of who can change the lives of millions, yet do not care enough to help and are too busy to get involved. The true terrorists are those of us who have sufficient resources yet refuse to share. True terrorism is turning our backs on those that need our help the most while we quietly sip another latte at Starbucks. This entry was posted in Hunger & Poverty, News & Views, Quotes and tagged Allahu Akbar, business, caring, children, disease, economic systems, finance, government, hunger, inequlity, latte, Peter Joseph, poverty, sickness, Starbucks, starvation, terrorism, violence, wealth on October 24, 2016 by Ray Buchanan. I have a real issue with this. We live in a world where over 20 of our family still die every day from hunger. This, therefore, strikes me as obscene. I think of myself as a practicing Christian, and for me such inequality is a matter of both basic morality and faithfulness to the teaching of Christ. Allowing any to starve, or even go in want, is unacceptable when we have means to prevent it. It is wrong on every level. Facts such as these serve as a reality check. Such disparity is a clear indication that we refuse to accept we are one family. Such statistics also demonstrate that calling ourselves followers of Jesus Christ is far different than living as one. This entry was posted in Facts & Statistics, Hunger & Poverty, News & Views and tagged billion, Christ, dispairity, faithfulness, hunger, inequality, lifestyle, money, morality, obscenity, possessions, poverty, reality, riches, starvation, statistics, wealth, world on October 3, 2016 by Ray Buchanan. Guest post written by Kara Cloud, a student at St. Joseph High School in Trumbull, Connecticut, and participant in this year’s 30 Hour Famine at St. Philip Church. Inmy first year participating in St. Philip’s 30 Hour Famine, I was initially most struck by the diversity of the people who joined together to fight hunger — young and old, poor and wealthy, religious and nonreligious, parents, high school and elementary school students. 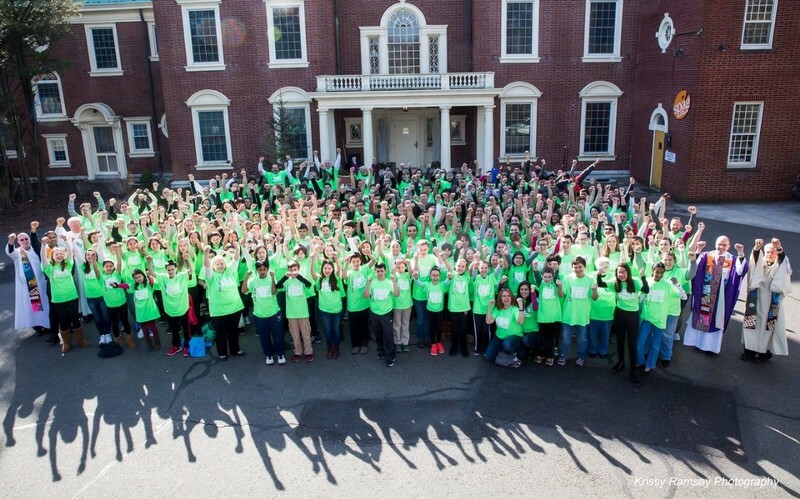 All people, all participants in the 2015 30 Hour Famine, were there because they wanted to be. That’s what intrigued me: who would want to give up four meals, do some physical labor, and spend 30 hours not eating with kids of all ages whom they had never met before? I was interested to the point where I had to figure out what it was all about. I entered with curiosity — I had no expectations seeing as I had not partaken in any event like this before. And I had no idea what a life-changing experience I was about to have. Typically, people are brought together over meals: holiday celebrations, cooking with parents, meeting up with friends for a dinner out. Yet, nothing has ever made me feel such a bond with others as voluntarily giving up our food for thirty hours to raise awareness for world hunger and poverty. How does your hunger help keep those thousands of miles away from being hungry? I’ve grown up asking myself the same question. When I was in elementary school, the people working in the cafeteria would always scold the students who threw away their uneaten meals saying, “There are children starving in Africa!” However, it was never explained to us what we should do to help them — because clearly stuffing myself wasn’t going to make them less hungry and there was no efficient way to donate the excess food on my lunch tray to those in need. It took until my sophomore year in high school before someone gave me an alternative that made sense to me: instead of taking what we have for granted, learn to live without and by doing so, learn to appreciate our privilege and do something with it. We are lucky to be a nation that has to force ourselves to eat less, because we have the excess food at our fingertips. 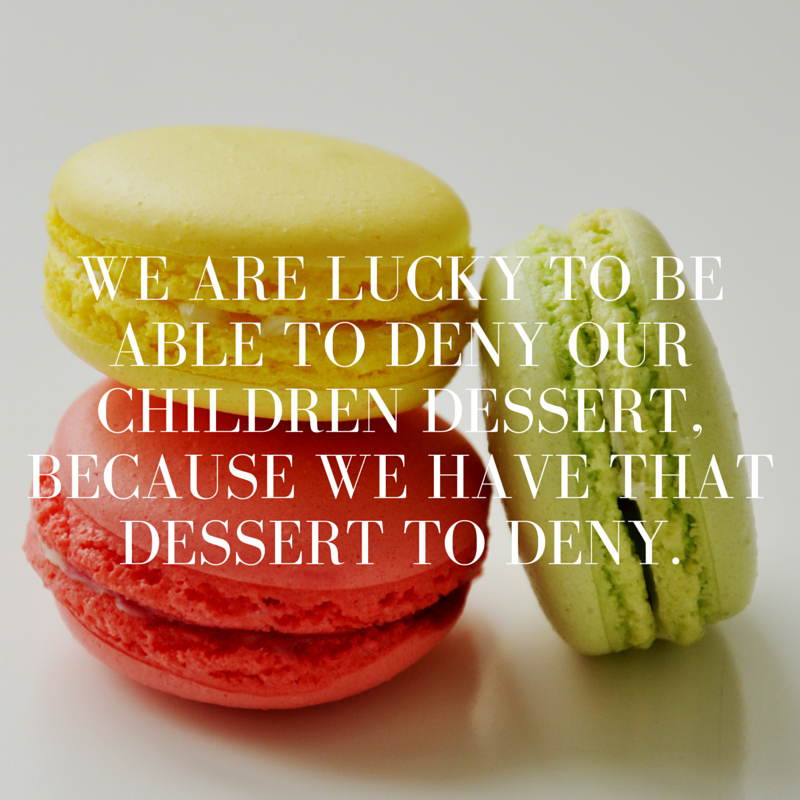 We are lucky to be able to deny our children dessert, because we have that dessert to deny. Why should we, who are only given these opportunities by chance, not feel some sort of responsibility to give others the same chance to eat a wholesome meal? Going hungry is not the same as being hungry, and all of the participants at 30 Hour Famine were well aware of their privilege as they came together to package 20,000 meals for the hungry in Burkina Faso, one of the poorest countries in the world located in West Africa. We were all thankful that in 30 hours we would be guaranteed a meal, that the hunger we felt would pass. It made the experience more bearable, easing the grumbles in our stomachs. However, while my feeling of hunger was pacified by knowing I could eat soon, my feeling of guilt at how lucky I am to be in the small portion of the world’s population that is guaranteed a meal at every breakfast, lunch, and dinner break was not as easily forgotten. We all were united with this recognition of our privilege and worked to grant others the same assurance of another meal, an escape from hunger, by taking donations at supermarkets, packing lunches, and making economical and substantial food through Stop Hunger Now and Catholic Relief Services in a system that uses basic ingredients to provide sustenance for a family of six for one meal. Everything I learned — the hunger facts, the importance of unity, numerous causes to raise money for, greater appreciation for my privilege — is evident in my smile, my composure, my thoughts. I came to the 30 Hour Famine a blank slate ready to be changed — and I did change. I became more aware, more appreciative, and more global-minded. The most important thing for one’s first Famine experience is to come ready to be changed, and then to go inspire change in the world. 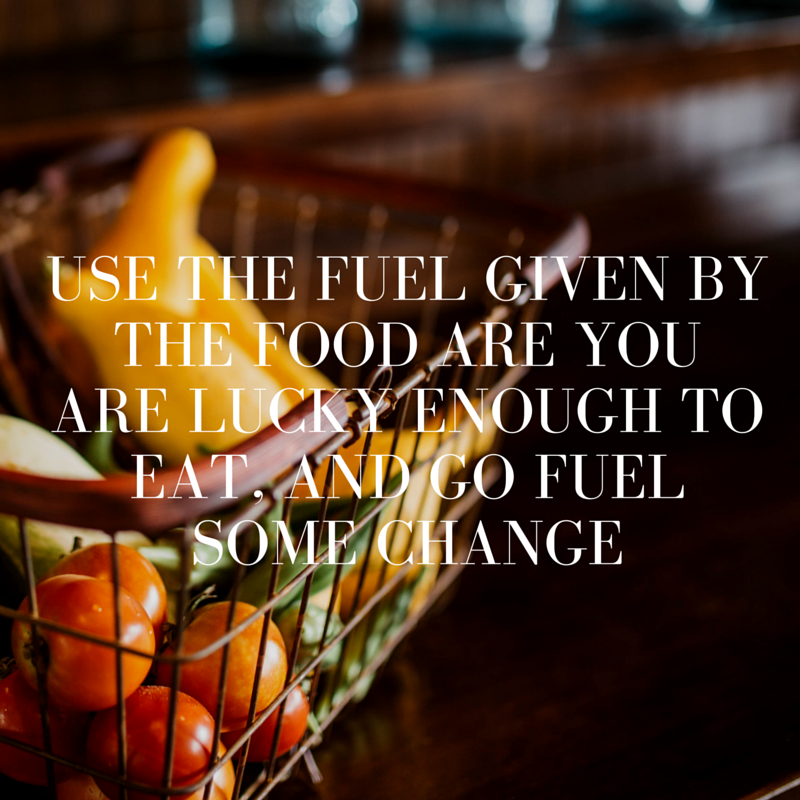 Use the fuel given by the food are you are lucky enough to eat, and go fuel some change. To learn more about the 30 Hour Famine and how you can participate, please visit http://stphilipnorwalk.weebly.com/30-hour-famine.html. This article originally appeared on The Hour. This entry was posted in Hunger & Poverty, News & Views, Quotes, Spirituality & Religious Writings and tagged action, awareness, Burkina Faso, children, CRS, fasting, global movement, hunger, Kara Cloud, poverty, St. Philip Church, starvation, Stop Hunger Now, Trumball Connecticut, vision, volunteers, working together on March 15, 2016 by Ray Buchanan. This entry was posted in Hunger & Poverty, Spirituality & Religious Writings and tagged bible, doctrine, hearts, hunger, love, poor, poverty, starvation, theology on February 12, 2016 by Ray Buchanan. Thousands are at risk of starvation in South Sudan because of war. The UN is demanding immediate access for humanitarian aid. The article reprinted below is by William Lambers for the Global Hunger Examiner. It is unedited. The United Nations warned today that 30,000 people are “facing starvation and death” in war-torn South Sudan. The UN World Food Programme, UNICEF and the Food and Agriculture Organization are demanding immediate access to these starving war victims, who are in Unity State. The war in South Sudan, between the government and opposition groups, has caused extreme hunger. Farming in conflict areas cannot take place. What little food is available has become high-priced. Nearly four million people are living with severe food shortages and on the brink of famine. Many displaced families report eating only one meal a day, consisting of fish and water lilies. Malnutrition causes lasting physical and mental damage in children, so it’s urgent the food reaches them quickly. The UN World Food Programme (WFP) is the lead hunger relief organization in South Sudan. Along with UNICEF, Catholic Relief Services and others WFP conducts emergency missions to relieve the suffering, provided they have access. WFP depends on voluntary donations and this must be kept up to provide the food aid. The United States Food for Peace program is the single largest donor to WFP, and Congress has to boost its funding. But a lasting peace deal between the warring parties has to take place for the humanitarian crisis to ultimately end. The alternative is famine for South Sudan. This entry was posted in Facts & Statistics, Hunger & Poverty, News & Views, Photos, Uncategorized and tagged civilians, emergency, famine, food, humanitarian crisis, hunger, South Sudan, starvation, UN, UNICEF, violence, war, warning, WFP on October 23, 2015 by Ray Buchanan.